".....perhaps the theme can have her relaxing having Massage and Pedicure? 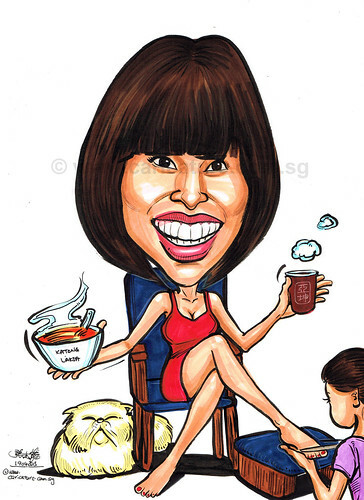 Her hands can be holding a cup of Ya Kun paper cup and Katong laksa?? She likes to takeaway a cup of Teh to the office so paper cup will be good. These are 2 famous household brands she will miss. How about her white fat Persian cat sitting on a flying Persian carpet??..."